Today I got to go to my amazing church at home, and hang out on the North Coast with these super-fun people… Phil, Ali and Ross. That’s us chillin’ (quite literally!) 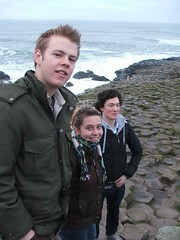 at the Giant’s Causeway. STALKING YOU, as of today! Oh… I’ll pretend I’m scared!! good picture! and its near the ocean. . ahhhh. . i can’t see the ocean where i live – only a stinking river. pooh!